With the arrival of social media, we have seen much change in the way we communicate today. Even the language we use has taken direct influence from social channels old and new. Twitter’s prominence today in pop culture and everyday conversation exemplifies this perfectly. After all, the definition of “tweet” was added to the Oxford English Dictionary in 2013. This year we have witnessed one of the most influential and powerful individuals on our planet, President Donald Trump, making regular headline news with the content he shares over Twitter. But just how did this massive platform come to be, and how has it developed over the years? This wasn’t Dorsey just abbreviating the word Twitter. In fact, the platform was originally launched as Twttr! At the time (and still very much so today), it was a popular trend for companies to drop vowels in their name. Just look at social channels like Flickr, Tumblr and Scribd. What if all social platforms did this? Can you imagine a world where Youtube was Ytb, Instagram was Nstgrm and Apple was Ppl. Since 2009, we have seem lots of tweaks to Twitter as they looked to innovate and compete in a truly ruthless industry. June 2009: Twitter introduces verified accounts, after many high profile celebrities had complained impersonation on Twitter. The verification tick can now be applied for by any person or business, letting people know that an account of “public interest” is authentic. July 2009: Twitter adds hyperlinks to #hashtags. People had already been using hashtags in their tweets, regarding specific events and topics, but now people could explore what hashtags just by clicking on them. 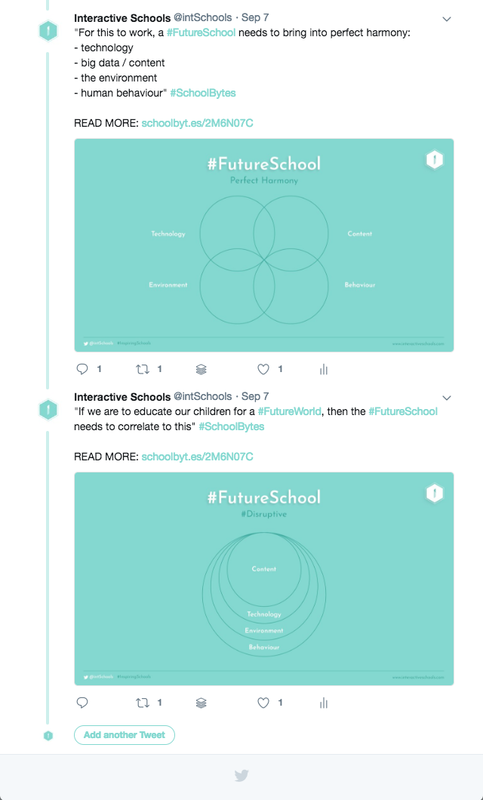 This was a hugely important step for Twitter, and today we see this as an essential part of our #SchoolStories led strategy. November 2009: Twitter introduces retweeting. Users had previously been reposting someone’s tweet by writing RT at the start of their own tweet. Twitter caught on and eventually introduced retweeting so people could do this easily, with the click of a button. September 2010: Twitter delivers “New Twitter” - the largest update to the website’s interface to date. The design had a complete upheaval, with videos and photos now viewable within Twitter. June 2012: Links pasted into a tweet now have a content preview, image or video of the link. This made the content being shared by URL a lot more dynamic and engaging. June 2014: Animated GIFs were finally able to be shared and viewed across all of Twitter’s platforms (desktop, mobile and app). March 2015: Periscope, an app that allows live streaming, was acquired by Twitter for a reported $85million. This highlighted a growing trend for live streaming across social media. October 2015: Twitter introduce poll questions to their Tweets, offering users an opportunity to ask polling questions with up to 4 possible answers. November 2017: The character limit of tweets increased from 140 to 280. The official announcement from Twitter was met with equal praise and criticism. December 2017: Twitter introduces a plus button to create threaded tweets easily. Just a month after increasing the character limit, it appears that Twitter is angling towards being able to share long for content more easily. Over the years, the Twitter logo went through some interesting iterations. By 2009 the classic blue bird Twitter logo, now looking like a cartoon character, was named Larry the Bird (after Larry Bird, the Hall of Fame basketball player). This did not last long, however, and he (the Twitter icon…not the person!) was later stripped of his identity; becoming more of a silhouette and being dubbed simply as Twitter Bird. Twitter has come a long way since its initial Twttr days. As tech continues to rapidly evolve, we fully expect this platform to adapt…what could be coming next?! !